My basement was a chaotic mess. There really is no other way to describe the disaster that was lurking below. 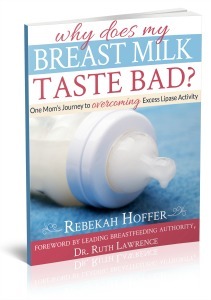 Thankfully, my mother likes a challenge. We decided to tackle the basement when she visited last month. Ladies and gentlemen, I present to you my before and after photos. I expect all the appropriate “ooooh’s” and “ahhhh’s” to come flooding into the comments as you enjoy the glorious transformation. 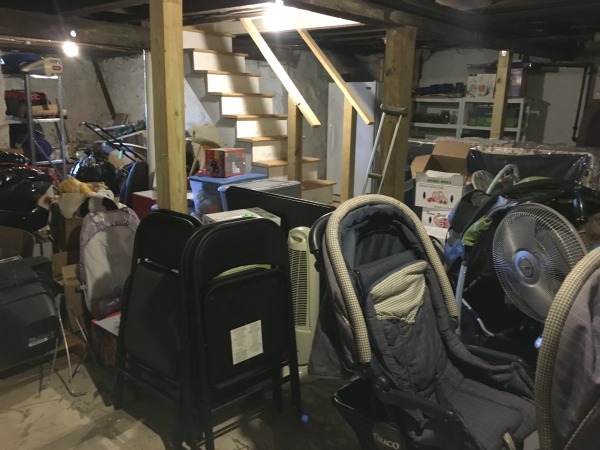 This basement cleanup was accomplished through 3 tasks. 1. Remove all the trash. Do you see all the cardboard boxes above? It is amazing how many empty boxes were tossed down into the basement, but never actually put in the trash or recycling! Other things that we threw away or recycled: random electrical cords (if they haven’t been missed yet, they won’t be! ), the leaf blower that stopped working, empty baby food jars, a 2 year old evergreen wreath, pine cones, old seeds, and much more. 2. 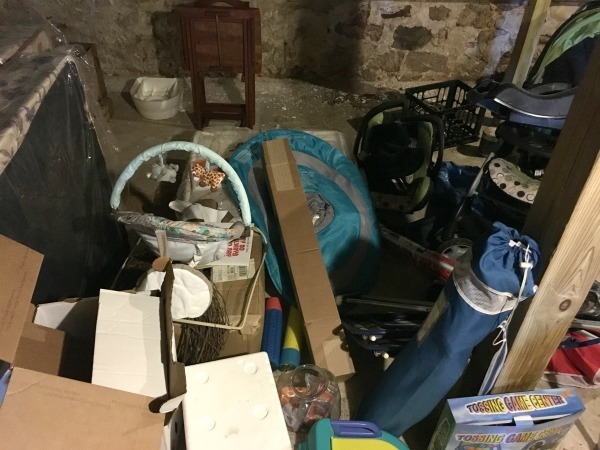 Remove all the items that don’t belong in the basement. Nate often receives donations for work. Most of the time those donations make it to work just fine, but sometimes he needs to unload his car before he can get to work. So where do those donations end up? Our basement. Nate and I had been saving a mattress and boxspring set for Grace. My mom helped me move that from the basement into Grace’s room. Grace was thrilled with the upgrade, and I was thrilled with the extra space in the basement. There were also many things that needed to go to our local thrift store. Plus I had a few things that belonged to a friend that needed to be returned. We used a Facebook yard sale group to get rid of an unwanted air conditioner and TV. Items that didn’t belong: 3 big boxes of baby wipes, stuffed animals, books, clothes, patio cushions, a soccer goal, and much more. 3. Reorganize what is left. 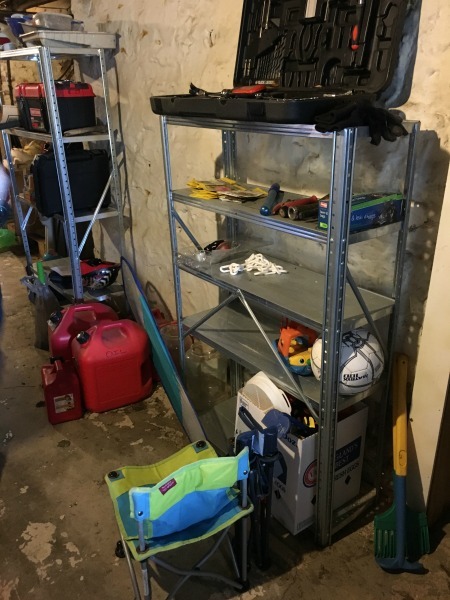 There was hardly a drop of organization happening in our basement. Organizing everything that was left in the basement was crucial to the cleanup. We started by utilizing the shelves more. One was moved to hold all of the paint cans. 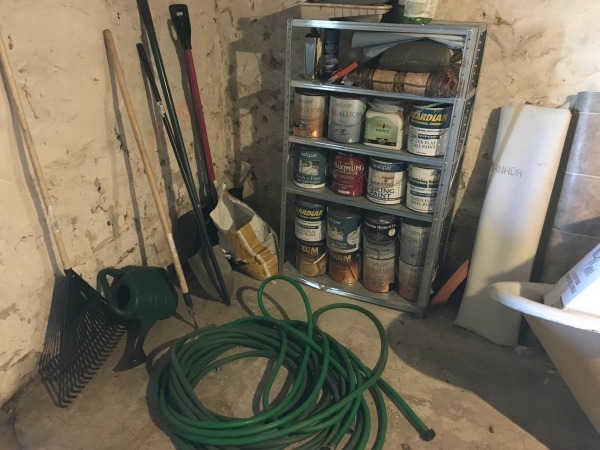 The other one holds tools and gardening equipment. 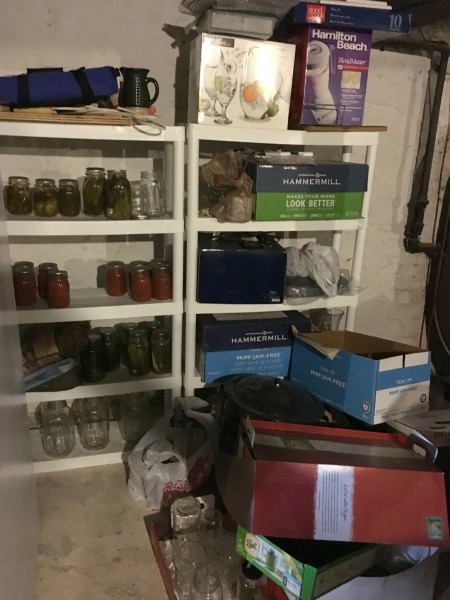 There were a lot of half-empty boxes holding a couple of canning jars. 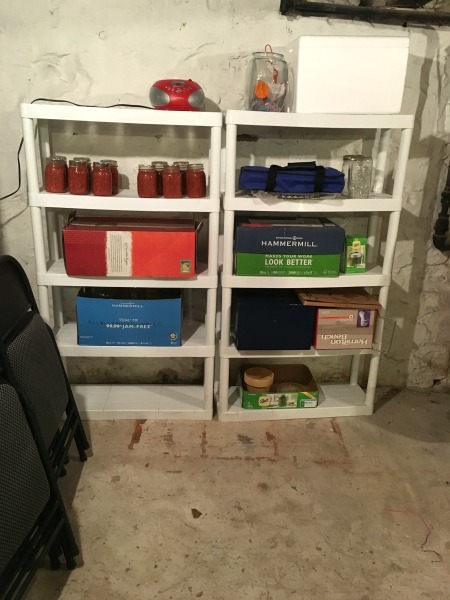 I sorted through the canning jars, and consolidated the boxes. There were also some wedding gifts still in boxes. Yes. I did say wedding gifts. Yes, Nate and I have been married for 10 years. Yes, I know that this makes me completely insane and perhaps a horrible person. I had completely forgotten that I owned this beautiful dish! Other wedding gifts weren’t my style, and now that 10 years have passed I no longer felt guilty letting them go. If you want to hear more about the wedding gifts that were hiding in my basement, listen to Sorta Awesome episode 37. 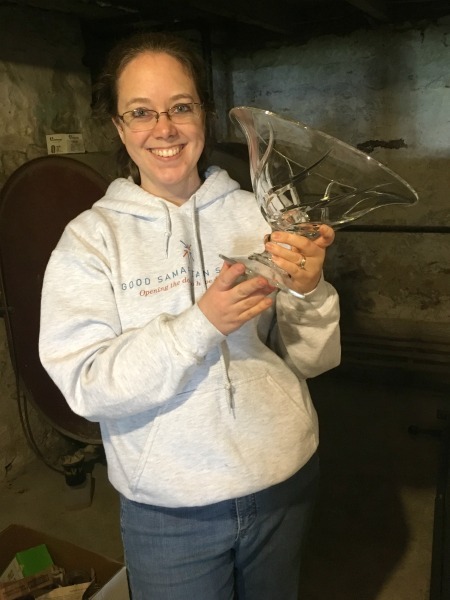 I am extremely thankful that I had my mom’s help with this basement cleanup. She knew how to be “stern” with me when needed, yet she also understood my point of view. She knows how hard it is for me to get rid of things. It was great to have her voice of reason telling me . . . This should go to the thrift store. This probably can be recycled. You really should keep this. 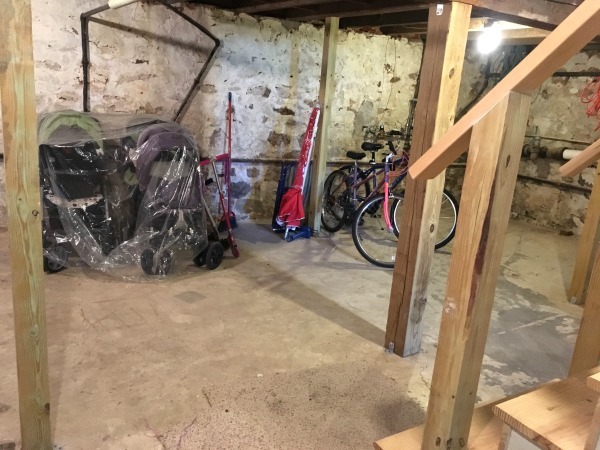 Now that the basement is so empty, Grace and Noah have been riding scooters down there! It has been amazing. 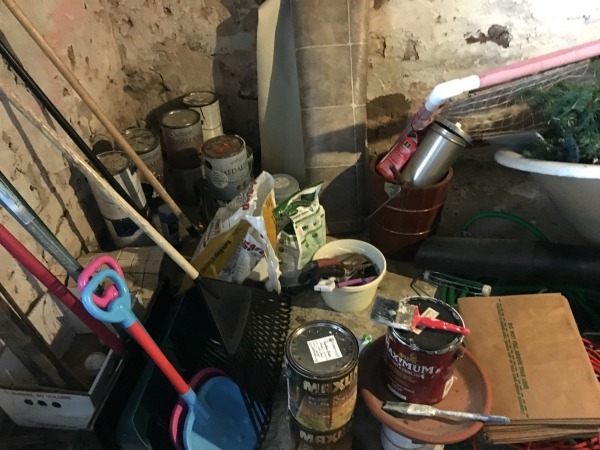 Looking for motivation & help with your own crazy cleanup projects? I highly recommend The Life Changing Magic of Tidying Up to hear from an expert on decluttering. I also highly recommend Decluttering at the Speed of Life: Winning Your Never-Ending Battle with Stuff for those who want to hear from someone who struggles with organization. Personally, I couldn’t relate to the author of The Life Changing Magic at all. It was inspiring, but her brain works completely different than mine. However, the author of Decluttering at the Speed of Life totally speaks my language. Both are great reads. Don’t have time to read a 240 page book? Dana White, the author of Decluttering at the Speed of Life, also has a quick eCourse that is excellent. The 5 Day Clutter Shakedown is five short videos (the longest is just 13 minutes) that cover how to declutter without making a bigger mess, how to find the time to declutter, and the two most important questions to ask yourself when decluttering. Click here to sign up for The 5 Day Clutter Shakedown. And use promo code NEWYEAR19 for $15 off the entire month of January 2019. Of course sometimes you just need a kick in the pants to get off the couch and clean something. All subscribers to Simply Rebekah receive a free copy of my Just Clean Something workbook. 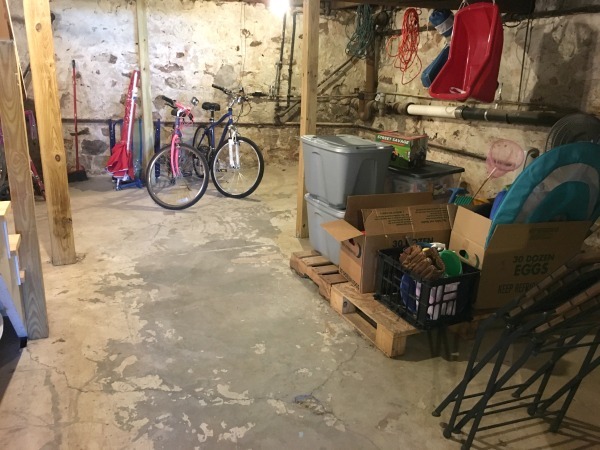 What do you think of my basement cleanup? 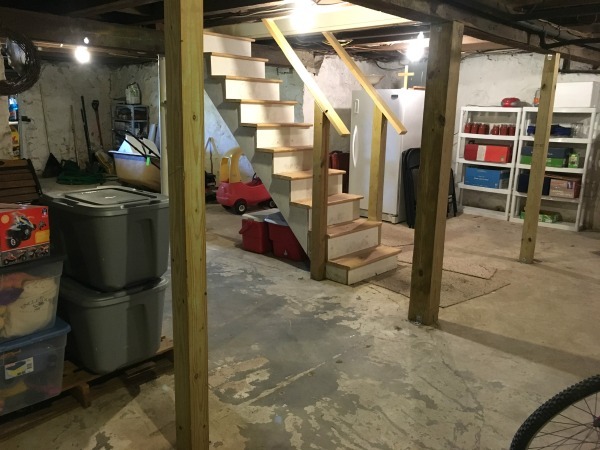 Does your basement currently look like my before photos or my after photos? Disclosure: This post contains affiliate links. 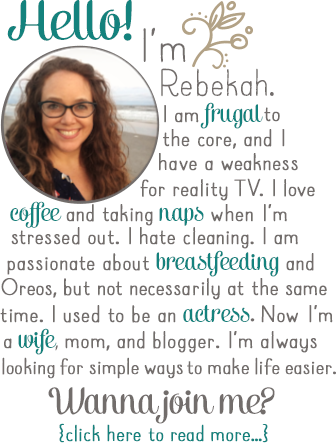 Thank you for supporting Simply Rebekah. You can read my full disclosure here. Rebekah!! Love this so much. 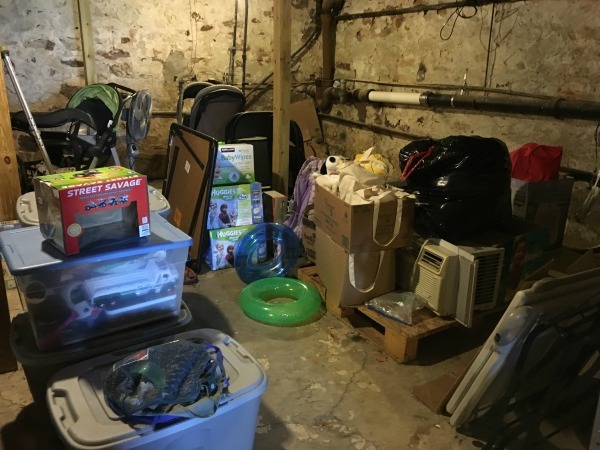 Your basement looks a lot like mine–unfinished, dark, and a little dingy. 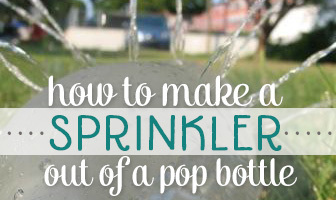 Thank you for sharing this glimpse into REAL (read: not Pinteresty) life. 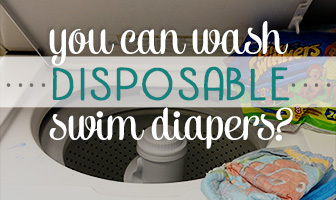 Here’s what I want to know: what are those plastic bags you have around your strollers now? 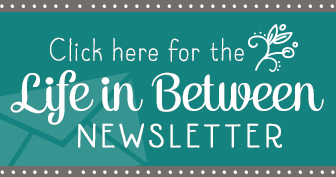 We have some baby things (like our swing, bassinet, etc.) that are too big and bulky to track down boxes for, but I would love them covered in something…besides just trash bags. Oh yes! 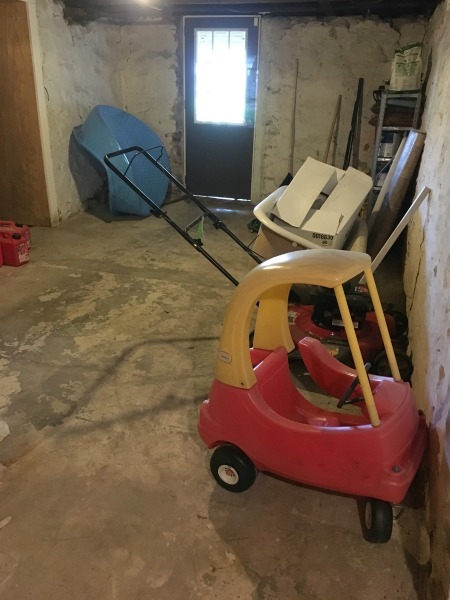 Our basement is TOTALLY REAL! Haha! Then my mom had the brilliant idea to cut the bags open (bigger) and use them to cover our strollers. I wish I could take credit for that idea! Very nice transformation. I always forget to take before pictures and I’m halfway through a project and think, this would have made a great before/after comparison. 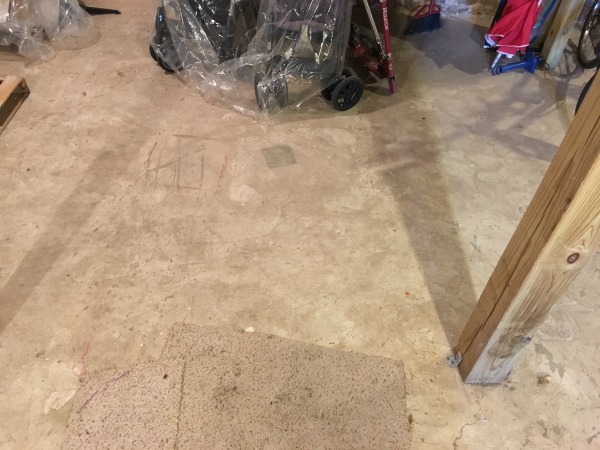 You might want to think about a little weather stripping for the bottom of your basement door. There is a lot of light coming in there, which means a lot of air (or critters). You have to start taking before pictures! They are so very satisfying to look at when the project is complete. Sarah, could you show your husband my blog post? 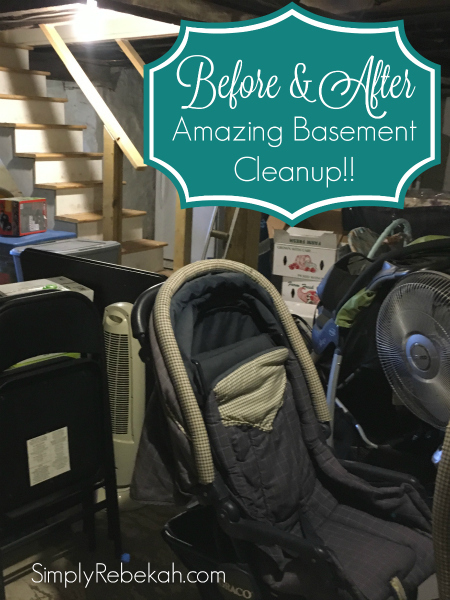 Tell him you think it is inspiring and you would love to see your own basement cleaned up, especially with the move coming up. Then perhaps the two of you could look at your calendars and pick a date for when you conquer your own chaos. It came be done!! Let me know what happens! But there was no way I could have shared that here. You would have written me out of your will! Great job ladies! I think I’m like your mom. I LOVE to organize stuff when I visit my daughters’ homes! So to me your project looks like it was fun and very satisfying to you both! 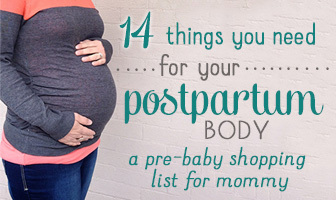 This is a great and practical post! I appreciate that you didn’t go out and buy a bunch of “organizing supplies” and such to make a huge difference in the usability of your space. 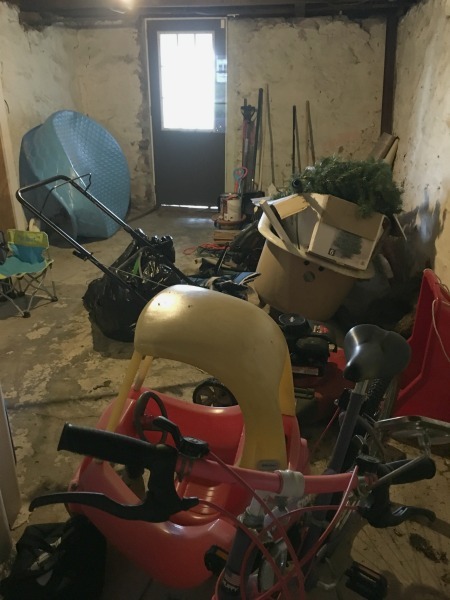 It is always amazing how much of what’s laying around garages, attics and basements is just trash that never found it’s way out or things that belong somewhere else or to someone else. Gotta love a good, dramatic after photo. Thanks for sharing! Thank you for your encouragement! Sometimes I think it is nice to see how “real people” organize their homes without going into debt at the container store! 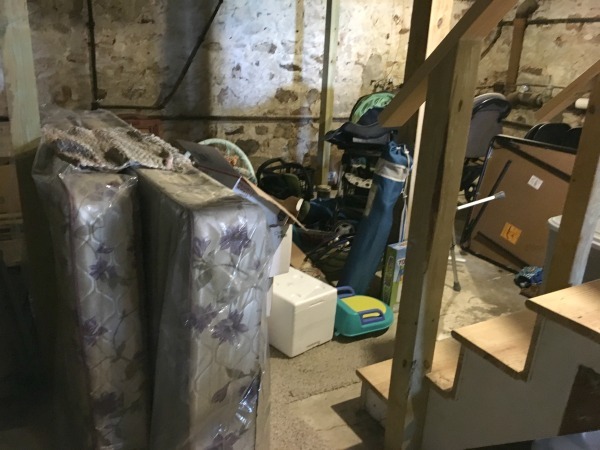 You can come any time to declutter our basement ! Thank you for being authentic about it! I will gladly show my authentic mess to help others feel better! haha! I wish I had a basement. (Oh, no, no I don’t.) 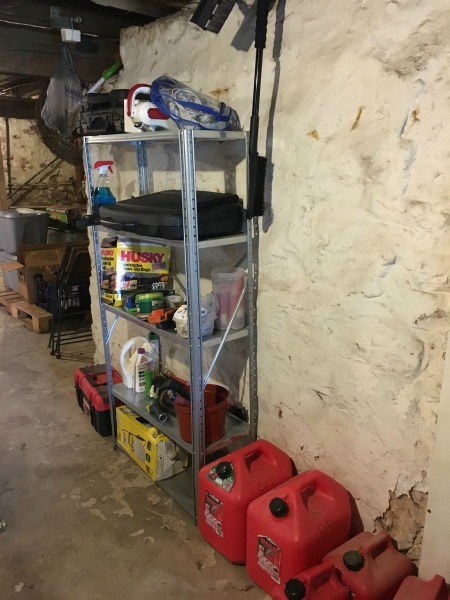 I have a garage and a storage container that need a lot of work. Great blog post. Lots of storage can equal lots of mess! Haha!